For over 20 years, Verragio has been a leading designer of sought after, exquisite diamond engagement rings and wedding bands. Today, they are one of the most well-known bridal jewelry brands in the world, offering some of the highest standards in the industry. 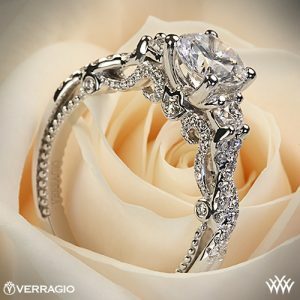 Verragio was founded by Barry Verragio, who began his career as an apprentice to a master jewelry maker at the age of 14. Once he had completed his apprenticeship and mastered the art of jewelry making, he decided to enroll into the prestigious Fashion Institute of Technology in a bid to develop his skills further. Whilst he was studying at the Fashion Institute of Technology, Verragio learnt from some of the very best instructors in the industry, including Maurice Galley, who had earned years of experience working with the prestigious Tiffany and Co. Under Maurice’s guidance, Verragio started producing his own designs for beautiful engagement rings and other bridal jewelry pieces. By the 1990s, Verragio had built up a wealth of experience in designing fine jewelry and had even developed his own unique setting technique. It was during this period that he designed the first ever Verragio ring – an engagement ring for his then girlfriend, now wife. When designing the ring for his future wife, Verragio called upon the Lumino setting technique, which suspends the center stone, allowing more light to enter the diamond, which, in turn, allows the stone to reveal its true brilliance and fire. On the back of the success of this ring, Verragio was encouraged to design and manufacture many more, leading to the internationally renowned brand of today. Verragio’s design philosophy is firmly focused on enhancing the overall appearance of the engagement ring, rather than trying to create an overwhelming presence. No matter how bold, elaborate, or intricate the setting is, they ensure that the center diamond is always the main focal point. All Verragio engagement rings are handcrafted with meticulous attention to detail, from the finest materials. All of the designs are crafted from 18K white gold, 18K yellow gold, platinum, and 18K rose gold, and the rings in the Parisian Collection are also available in 14K white, rose, and yellow gold. Refusing to compromise on quality, Verragio rings only feature high quality F-G color and VS clarity diamond melee. Verragio engagement rings are characterized by their iconic profiles, making them famous in the engagement ring market and attracting admiration from customers from far and wide. Today, Verragio offers fully customized rings and options including everything from mixed metals to intricate design details such as filigree work and beading. Their innovative designs are all totally handmade and are intended to evoke a feeling of timeless luxury and prestige. The Venetian collection allows you to customize your Verragio engagement ring from the inside out. This unique collection puts a firm focus on the side profiles of the rings, combining detailed craftsmanship and intricate details. With a totally customizable interior profile, the Couture Collection allows you to create a ring that is as unique as you are. Featuring Verragio’s trademark Lumina setting alongside a crown-shaped bezel beneath the center stone, the collection stands out thanks to its use of multi-coloured gold and clean cut designs. The Insignia Collection is characterized by a unique profile design that is reminiscent of the Verragio logo. With their ornate scrolls, delicate swirls, and, of course, the trademark Lumino setting, the collection is effortlessly elegant and feminine. The Parisian Collection offers the most options for customization out of all the Verragio collections. With customizable diamond and non-diamond wraps, French beading, and lacework, available in white, yellow and rose metals, this budget friendly collection allows you to enjoy the brand’s iconic vintage designs without compromising on style or quality to fit in with your budget. This collection is available in 14ct gold for lower cost. Verragio’s Classic Collection embraces timeless and elegant engagement ring styles, bringing together distinctive and artistic style elements in white, yellow, and rose gold. You can explore the full Verragio Engagement line here and also at Whiteflash and James Allen. With any successful jewelry piece, it is inevitable that replicas and imitations will start to crop up in the market place. And it’s no different for Verragio engagement rings. Although these replicas can be extremely tempting due to their typically lower price tags, we would strongly advise you to steer clear of them, for a number of reasons. Firstly, it is extremely unlikely that a replica ring will offer the same level of quality or craftsmanship as the genuine article. The vast majority of Verragio engagement rings feature intricate details and complex designs, which are difficult. The last thing you want is to end up paying a substantial amount of money for a botched job. 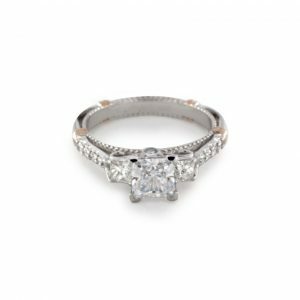 What’s more, even if you are able to find a highly skilled bench jeweler who is able to make a design that is incredibly similar to an authentic Verragio, you will probably end up paying almost as much as you would do for a Verragio. So, if you want our advice, we’d always advise investing in a genuine Verragio ring. After all, although you may pay slightly more for the Verragio name, you will potentially save a great deal of hassle, risk, and disappointment. 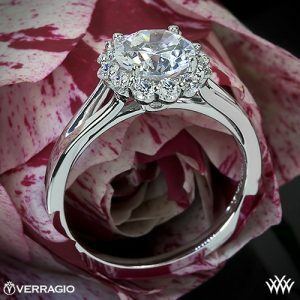 Where can I buy a Verragio Engagement Ring? You can only buy Verragio semi-mounts (empty settings without a center diamond) from the brand’s authorized retailers. 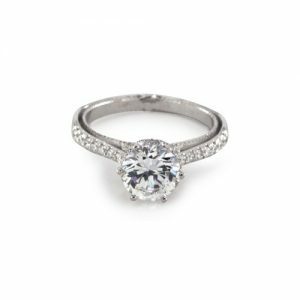 Of course, you will then need to source your own diamonds to complete the engagement ring, and this is where, for some buyers, the process can start to get a little more complex. Although all of Verragio’s authorized retailers are fully certified to sell genuine Verragio rings, many of them will not necessarily be the best places to buy the required diamonds from, as many offline retailers have a limited choice when it comes to their diamond inventories. 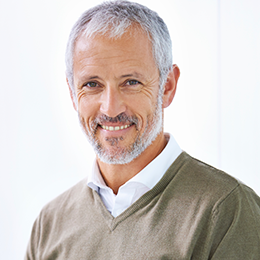 Using an authorized online retailer, such as Whiteflash or James Allen, will allow you to resolve this potential problem and enjoy the best of both worlds. As well as supplying an extensive range of Verragio rings, they have a huge catalogue of high quality diamonds to choose from. 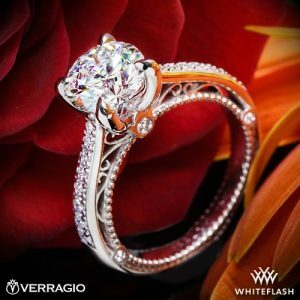 If you’re looking for an engagement ring that offers exceptional quality and artistic design, then you should definitely consider a Verragio design. Although the fact that the rings are only available as semi-mounts may seem problematic, providing that you use the right, authorized retailer, this should not present an issue.